This project was super easy and fun to make. An excellent project for a beginner sewer. 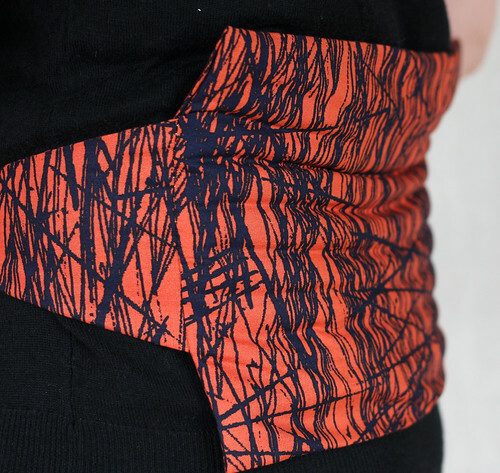 The Obi Inspired Hot & Cold Pack would be a great gift for a friend with back pain (pregnant women would love this). It only takes about an hour to make. Melissa made two packs: A practice one with fabric from her stash (for her) and one with Habitat Birch Blue by Jay McCarroll (for her husband). After making the first one, She realized she needed to make some changes to make a more manly one for her husband. Melissa realized quickly that the smaller ties and the larger pocket might cause the pack to flop and not function properly. 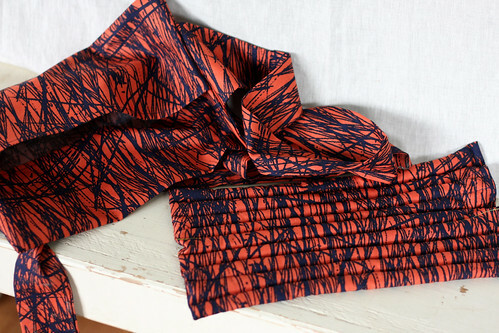 Because of this, she made two simple trapezoid fabric pockets out of some leftover fabric (there was plenty). She cut these 6″ at the top and 3.5″ inches at the bottom and about 5″ long on the sides. She cut out four pieces to make two trapezoids. With two pieces, right sides together, sewed up both sides, then turned them right side out and pressed it to make two trapezoids. After completing step #2 as written in the book, she attached one trapezoid to each of the raw end of the ties (the smaller end of trapezoid to the tie) and then followed the directions (direction #3) for attaching the ties as it is in the book. They work great! Melissa said now that she and her husband are each armed with a Hot & Cold Pack they have no excuse not to get their garden ready for the Spring…pulling weeds for the first time in a season is a good reason to use these packs. Jacqui found one mistake in the cutting. The ties should probably be cut to a width of 4″ instead of 2″. Following the instructions, the tie was a very narrow 1″ unlike what is seen in the picture. She recut hers to 3.5″. 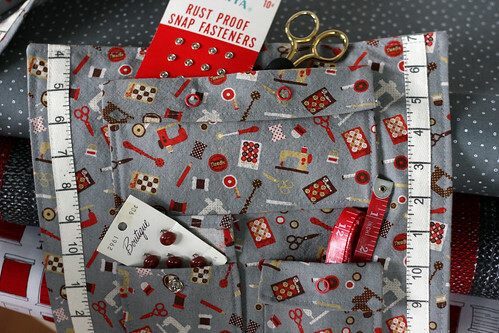 It is easier to attach the pocket snaps before sewing the pockets onto the main body. She opted to use a piece of wool for the needle holder instead of regular fabric. To hold the twill tape trim in place while sewing it on, she used water soluble adhesive tape (Wonder Tape). 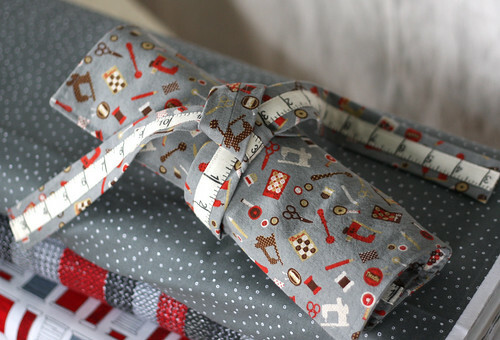 Three yards of trim would be enough to sew onto all 4 sides of the sewing kit and both ties. Other than recutting the ties, she followed exact cutting measurements and placement. The finished project picture in the book appears to be longer. There was not room to place the 5/8″ wide trim on the top of the sewing kit. 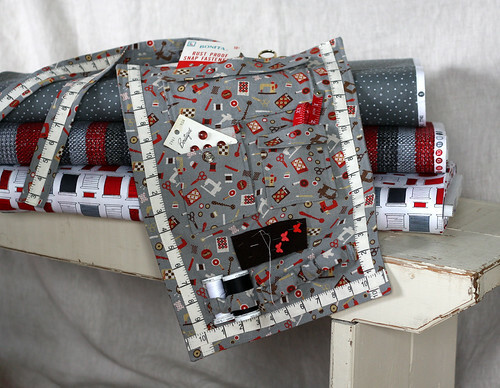 The sewing kit is perfect to take to sewing classes. The fabric and trim match its purpose. 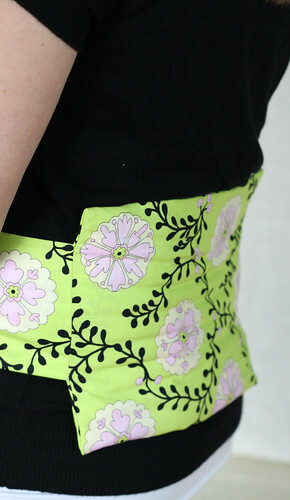 Jacqui loves this project, especially the dual use pockets. You can either place your items inside the snap pocket or place it behind as an open pocket.